Our Frequently Asked Questions page answers the most common questions about our modular homes. Do you want to build a modular home in California? Most of your questions will be answered here. If your question is not on the list, please contact us. Which Green Building Programs can your homes qualify for? Our homes will qualify for many categories of points under all of the recognized green building programs. We can work with whichever program our clients are interested in using, or any program required by the local building department. We recommend the Green Point Rating program from Build it Green for single-family residences. For multi-family and commercial projects, we recommend the appropriate LEED program by the US Green Building Council, of which we are a member in good standing. Learn more in this video series about Cutting Edge’s Green Modular Construction. Are there model homes that I can visit? We have completed homes throughout the state that are made available to interested clients that sign up for our newsletter. We do not have a temporary “model home center” as is common in the manufactured housing industry as we only build permanent homes. We have announced home tours for our newsletter followers when invited to by our clients. The tours are during the period of time between when modular building components are installed at the site and prior to completion and occupancy. Less frequently (for privacy reasons) we are invited by our clients to hold tours after the home is completed and occupied. All home tours are by appointment only with verified interested clients. We can also provide interested clients with the locations of homes already built if you want to drive-by and see how our homes look. My real estate agent / loan broker / friend said that they don’t allow modular homes in my neighborhood. Is that true? Will I have difficulty in getting my home permitted at the local building department? Our factories will be happy to accommodate any concerns that the local building department has, and we often encounter building department officials that have no idea what the law is. A Cutting Edge Homes representative will contact the building department to clear up any concerns, and if there are any misunderstandings we will have the California Department of Housing and Community Development contact your local building department to inform them of their responsibilities. Regardless of what an individual at the building or planning department may say, the stringent California state law preempts local building department permitting requirements. You will not be required to go through a complete engineering “Plan-Check” that similar site-built homes must go through or pay engineering “Plan-Check” fees, because the state of California has already performed the “Plan-Check” function during the approval process for your home. The local building department plan checks portions of the project that are done at the job-site only. The tool that we use to get our homes permitted quickly is the “California Factory Built Housing Guide for City/County Building Departments.” Check out this document if you want greater insight into why our homes are just regular homes. Important Notes *** When building a modular home there is a required state-level review of the engineered plans representing what is built in the factory. Each model requires plans specific to the design and location it will be installed. This process coupled with the local plan check of the entire project negates any time efficiency in the permitting process versus stick-built construction. You can gain major efficiency in the construction process. However, our experience has been that the overall modular home permitting time frame is not shortened vs. site-built construction permitting. There is still a benefit to the modular home engineering process because it does minimize local plan check comments & revisions for the modular home itself. This takes out a lot of the guess-work and stress associated with the typical local review of plans of a site-built home..
What about the re-sale value of a modular home? Since a modular home is built to meet or exceed the same standards as a home built on site, it should appreciate at the same rate as a comparable site built home. Unlike manufactured or mobile homes, a seller of a modular home does not have to keep a state or federal insignia on the home stating that it was built in a factory. The national appraiser’s guideline does not have a designation for a modular home versus a site-built home. Each are permanent, regular homes. Fannie Mae’s “Selling Guide: Factory-Built Housing: Modular, Prefabricated, Panelized, or Sectional Housing” explains the appraisal and comparable property requirements when an appraiser values a modular home. The state of California considers a modular home, known legally as “Factory Built Housing,” to be fundamentally the same as a home built on site. The legal department at the California Department of Real Estate (DRE) has said that if their lawyers were real estate agents in the field, they would not disclose that a home was built using modular construction methods at resale, because you only disclose negative items. A modular home is simply a “Single Family Residence.” Future sales of the developed property will be registered as fee-simple real estate. From a legal standpoint, the only difference between modular construction and stick-built construction is during the construction phase. At completion, each construction method renders an equal home from a legal, regulatory, insurance, and appraisal standpoint. A home built on a more modest budget will look like a stick-built home built on a modest budget, and a home built on a larger budget will look like a custom stick-built home built with a larger budget. This home that we built sold almost immediately and at a premium in Palo Alto in the Silicon Valley, California. Do you offer multi-family plans for apartment, condo, or town-home projects? Yes. Modular construction is a particularly well-suited and cost-effective solution for the constrained job-sites typical in multi-family construction. A few examples of multi-family plans that we can build are available in our Multi-Family Plan Collection. Please contact us with more information about the number of units and expected finish for your project so that we can provide you a project-specific quote. I know a real estate agent who says that your homes have to be disclosed as manufactured homes and appraise like manufactured homes, not like regular Single Family Residences? Our prebuilt, modular homes are built to the International Building Code (IBC) and California Building Code (CBC) just like any other single-family residential structure. We do not build to the federal affordable housing code used for manufactured homes called the HUD code. If we had a permanent steel frame under our homes and a bunch of piers, then it would be a manufactured home. The design and engineering process of our homes is identical to any other Single-family residential project, and the requirements made of our plans and homes are the same – meet the regular house state and local building codes. When you look under a modular, you see the same thing that you see under any site-built / stick-built home that is built on-site on a raised floor system – wood floor joists sitting on top of a regular ‘ole concrete foundation. These are all just homes built to state and local building code. Because they are all homes built to state and local building code, there is nothing to disclose as long as the home ends up permitted as a Single Family Residence by your city or county. People don’t disclose that their refrigerator was not built on-site, that their cabinets were not built in their kitchen from raw lumber, or that they did not pour their sinks into molds and bake them in a kiln in their garage. The system of building does not matter as long as you get to the same place, and disclosures are limited to negative facts. To read California’s required Residential Real Estate Disclosures, go here. The appraiser will compare the finished home to the neighboring properties, like any appraiser does, based on the Uniform Standards of Professional Appraisal Practice (USPAP). If your modular home has nice architecture and roof-lines, an entry porch, an attractive patio, and great amenities and features, it will be worth more than a “wood framed site-built home” of comparable size that doesn’t have as good of amenities as you have. And, vice-versa, if you just build a very basic modular home with no amenities, a “wood framed site-built home” of comparable size with lots of amenities will be worth more. Your real estate agent friend is probably trying to do you a favor and keep you away from buying what they think of as a “trailer”. That makes two of us – we don’t sell any “trailers”, or manufactured homes, so if you buy one, we won’t get the deal. Is it possible to determine the total cost of my project before I get started? Modular building has a number of benefits over traditional stick-built construction. One of the main benefits is that we offer a large variety of predesigned plans and we are able to provide current and consistent pricing on these homes. Going with a predesigned modular plan is usually the most cost-effective approach when building a single family residence. There are a number of items that cannot be priced without your getting a complete set of construction documents for the on-site work. A complete set of plans details things like your grading, utilities, foundation, garage, driveway, walkways, landscaping, city fees, etc. 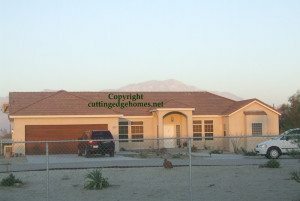 Cutting Edge Homes is not a construction company so we do not provide estimates for on-site work. Once your plans are done, we can introduce you to licensed contractors who would be happy to provide you with a detailed estimate. Do your modular homes come with garages or do you build them? Many of our homes show a garage either on the floor plan or on the elevations. What is represented in the pictures or renderings is just one way that the garage might be done. Your garage can be attached or detached from the home and can be done in a variety of sizes and styles. Garages are big empty spaces and do not have a floor system that can be used for transportation to the site. A garage is more economical to build at your property and therefore almost always is built on-site. Cutting Edge Homes would be happy to order optional materials for you that can be used to finish your garage so it matches your home.